This week's featured lesson is an original composition I've entitled 'Easy Travis Style Lesson in C.' I've created two arrangements for this lesson in which we'll learn some basic and fundamental Travis-style picking. The first time through well play a basic melody along with the alternate bass. The second time through we'll embellish that melody and add some ornamentations to spice things up. 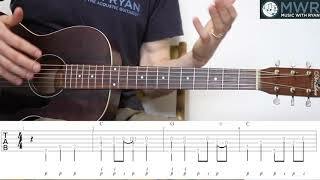 This will be a great lesson for anyone wanting to start learning fingerstyle or Travis-style picking. I'll break everything down for you note-for-note so you can understand exactly what's going on and begin to get a handle on this style of playing.